For the ones that have been following my posts, you know that I have been struggling with how to express my theme of the EV future. I touched upon this dilemma in numerous post and mainly in this one: Investments in EV Value Chain. 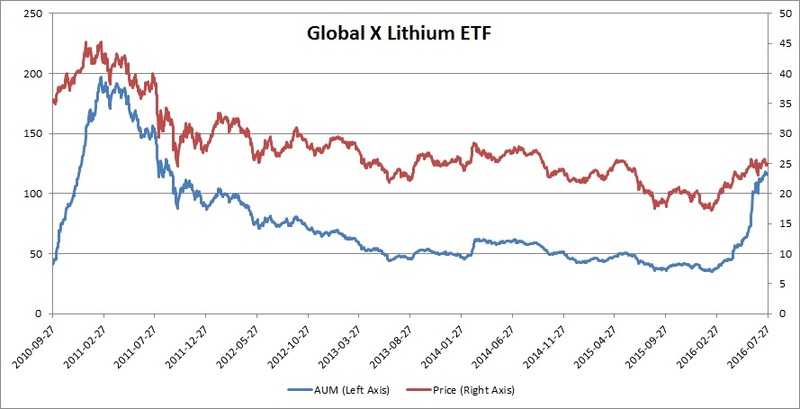 Today when I reviewed the largest shareholders in the battery producer Coslight Technology, which I’m invested in, something interesting popped up – an ETF called Global X Lithium was a shareholder. I went ahead and looked at what this ETF actually holds in it’s portfolio, and I was surprised to see how close the holdings resembled the list of stocks that I have under watch and try to follow, regarding news-flow etc. This could definitely be a catch all ETF for you readers to buy, who don’t have access to, or do not bother to buy stocks in markets around the world like I do. I won’t invest in an ETF for this blog, but it’s still worth exploring the ETF. Let’s take a look at how they built the index. The Index has 25 constituents and it’s interesting to see that I own(ed) several of them (BYD, Coslight and SAFT which I sold due to take-over). I also have Samsung SDI and LG Chem on my watchlist of potential stocks to invest with. Without doing a too deep dive, I’m guessing the ETF was promoted at launch and thereafter interest has fallen as performance has not been good at all. A few other things can be noticed, starting around this spring the performance has turned around and interest (AUM) has at the same time spiked. Still in relative terms, this basket has massively underperformed most benchmarks around the world. The Index is down -41% since start of 2011 whereas S&P (without dividends) has returned 70%. This year, 2016, the Index has outperformed S&P with 16%. Could this be start of a turn-around and the long up-trend I believe we will see in the sector? Another interesting factor is something seen in other ETFs that become “too popular”. Fairly small companies can belong to an ETF which gets massive inflows and the ETF providers are forced to buy stocks in the smaller company and thereby pushing the price significantly. This happened earlier with the Cyber Security ETF (HACK US) and affected the small Finish Anti-virus provider F-Secure. Let’s calculate how much inflow is needed in the ETF to start pushing the price in my holding Coslight Technology. The fund holds a 0.9% position in Coslight. Looking at this years spike in AUM, the biggest inflow was on June 13 with 15.7 MUSD in one single day. This translates to 15.7*0.9%*7.75 = 1.1 MHKD, which is about 30% of an average daily volume, so not enough to move the stock price (the stock was actually down over the day). But this ETF is obviously not something famous (yet). So let’s play with the thought that the ETF gets the same type of exposure as the HACK ETF which grew from a few million AUM to over 1bn USD. It had an maximum inflow of 175 MUSD on one single day. Re-doing our calculus: 175*0.9%*7.75= 12.2 MHKD which is about 4x the average daily volume, obviously a somewhat unrealistic scenario, but you never know. This ETF might be a good choice for a portfolio that believe in the Future of EV. Just remember that there is a possibility that EV becomes a reality, but competition is so fierce so no money is made by the companies in this space, something like the aero-industry, never put all eggs in one basket. Criteo the company I recently wrote an article about, has started a legal battle with the private competitor SteelHouse. So what is it all about? Well you can read it yourself in these two business insider articles: It started with Criteo and then SteelHouse came back with a counter. The growth numbers Criteo have been pulling, are impressive indeed. But if it was one thing that was very hard for me to understand, it was the inner mechanics of how they generate their revenue. Since I don’t fully understand it, you might say I should not have invested in the first place. I guess I somehow was tempted of all that juice growth, in this case i never really considered any fraudulent behaviour. And that might be my lesson, but here I am, not any longer comfortable with Criteo’s “black box” as SteelHouse calls it of revenue generation. One lessons I learned in the past is, if you are no longer sure of your thesis, then sell. You can always buy it back later. I sold my full holding as of today’s close. Now I have way too much cash on my hand (17%), I need to find some new good investments. The company which collects toll fees at highway bridges in China and pays out a large share of the profits as dividends has been a long term holding in my private portfolio. But all good things come to an end. Time to sell Yuexiu Transport and Infrastructure it has been treading water for a while and the weak RMB risk to dissapoint investors at the next result update. I sell the full position as of todays close. At the same time I enter a 3% position in the train and railway maker CRRC listed on the Hong Kong exchange. China has big plans for it railways but also to export their knowledge and sell trains and new railways around the world. Somewhat tricky owning a company which is so controlled by the Chinese government, but I believe this company will be a winner in the Chinese One Road One Belt strategic plan.